In this 5 reel/10 line slot machine you will be able to get the fortunes of ancient Greece. Join Poseidon under the deep blue sea and unlock the bonus feature by hitting three Gate symbols which will give you ten free spin and a randomly chosen Special Expanding symbol. This great Novomatic slot machine will surely entertain you more than any odyssey. Graphics & Appearance: This slot is one of the most detailed and best looking machines on the market. The symbols and the theme are obviously taken from the Greek mythology of Poseidon – the Lord of the Ocean. All Symbols are very detailed, especially the picture symbols. The background is an underwater world filled with ancient ruins and treasures. Gamble Feature: Once you have won a reel spin you will be able to gamble your winnings by clicking on the gamble button, next to the Start button in the lower right corner of the game window. By doing this, you will be taken to the gamble feature where you are confronted by a 50/50 gamble. In the gamble feature you choose which colour the next drawn card will be – red or black. If you pick the right colour you win and double your winnings. You can then choose to either gamble again or return to the reels. 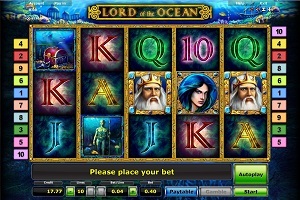 Game Symbols: In the Lord of the Ocean slot machine you will meet some very graphically detailed symbols. The Poseidon symbol is the symbol with the highest payout followed by a Mermaid. The scatter symbol is randomly chosen for you once you have hit three or more Gate symbols. By hitting three or more Gate symbols you will also get 10 free spins. There is also a Treasure Chest and an Ancient Statue symbol. The lower paying symbols are Ace, King, Queen, Jack and Ten. Bonus Feature: You will trigger the bonus feature (10 free spins) by hitting three Gate symbols. You will then be awarded the free spins and a Special Expanding symbol that can expand over the whole reel and give you some very generous winnings. The Special Expanding symbol is randomly given to you as soon as the bonus feature has been triggered. The bonus feature can be re-triggered while you are playing your feature so you shouldn’t be surprised if you get end up having thirty or forty free spins added to your bonus feature. Betting Options: This is a 5 reel/10 line slot machine where you easily can configure your bet preference by using the + and – buttons in the lower part of the game window. Game Features: You will be able to use an Autoplay function in this slot machine. You can easily start and stop this function by clicking on the Autoplay button which is located on top of the Start button in the lower right corner of the game window.